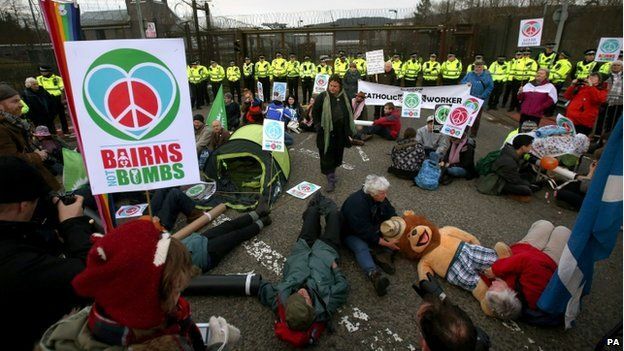 Yesterday’s blockade of the UK’s nuclear weapons base at Faslane in Scotland was a huge success with the gates blocked from 7 am until 1.30 pm and many workers, who had been queued up in buses in nearby Helensburgh, sent home after refusing to be ferried in to work via Greenock and the Gareloch. In keeping with the “BairnsNotBombs” theme several families and children took part in the blockade, with two families prepared to be arrested together. Ester Sisoroky and five of her six children locked themselves together in a determined opposition to the ongoing deployment of Trident. Ester’s husband Samuel, a Church of Scotland Minister, was prepared to take their five year old son, who they felt was not yet ready to decide for himself whether to engage in civil disobedience to the side of the road. In the end though the Siroky family were able to stay together on the blockade until the end as the police made no move to clear the North Gate. Anna Sanna and her partner Petter travelled from Sweden with their six month old baby to join the blockade. They too were prepared to face arrest. But it was not all about bairns. Lifelong SNP activist Isabelle Smith celebrated her 84th birthday on the blockade. Isabelle’s story was reported in the Sunday Herald and her picture was on the cover of the Daily Record. The near 300 people who took part came from diverse political persuasions but they were united in sending a strong signal in the context of the general election that we all must take this unprecedented opportunity to elect a Westminster Parliament that will relegate the UKs nuclear weapons to the dustbin of history. And indeed, following on from the George Square demonstration which saw thousands march, the day of direct action did send that message. It was reported in every major paper; news of the blockade has reached over 196,000 people on Facebook as of 15 April and still counting, proving the value of joining up nonviolent direct action with political action and demonstrations in an overall campaign. Among the affinity groups blocking the gates to Faslane were Greens, Christians, the Radical Independence Campaign, the Scottish Socialist Party, Faslane Peace Campers, Stirling Uni CND, Welsh campaigners, Quakers, the Socialist Workers Party, Glasgow Anti-militarists, Tweedale Peace Group, Trident Ploughshares, and miscellaneous peace groups. A group of students from Aberdeen University Shared Planet group held the Oil Depot Gate and a group of mostly women from the Gareloch Horticulturalists affinity group dressed as bairns in Onesies and Nappies held another gate in a quiet corner of the ominous base. But they were not as innocent as they seemed: beneath their playful costumes they carried chains, ready to lock themselves together should the police insist they clear the gateway. The students spent the day laying in the road locked on with their arms in plastic and metal tubes as did dozens of others at the North Gate and the smaller gates. At the South Gate, after some 24 blockaders were eventually removed from the road after 4 hours another group drenched themselves in red paint and occupied the road, forming the Peoples Red Line against Trident. They danced joyously to the frantic beat of the Rhythms of Resistance Samba band for what seemed an eternity before laying down in the road in an impossibly twisted jumble of lock-ons. In the end 34 people were arrested after being cut out of their lock-ons at the South Gate, charged with breach of the peace, while two women were arrested and charged with malicious mischief for painting the fence. At about 2:30pm the rain came on. Impossible to think of a blockade at Faslane without it. But Gate support covered them with tarps and all kept cozy until just before 3pm when people converged on the North Gate for a closing ceremony and wound up the blockade as planned. Photos by Sandra Franco and Maggie Kelly. This entry was posted in Uncategorized and tagged disarmament, Faslane Peace Camp, Gareloch Horties, nuclear disarmament, Nuclear weapons, Patrick Harvie MSP, Radical Independence Campaign, Scottish Green Party, Scrap Trident, Trident by admin. Bookmark the permalink.